It wasn’t even nominated at the time, but Daniel Rioli’s brilliant goal against West Coast in Round 3 has won the AFL’s goal of the year award at the 2017 Brownlow Medal. The Richmond star was retroactively nominated in the top three alongside two other indigenous players in Sydney’s Lance Franklin and Adelaide’s Eddie Betts. Betts was going for three goal of the year awards in a row while Franklin’s goal on the run against Adelaide was also unlucky to miss out. However, it was Rioli’s ability to make something from nothing against West Coast that gave him the nod. 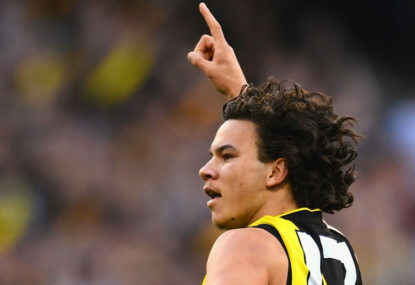 Adding to the goal’s brilliance was the fact Richmond were under the pump at the time – down by six points in the third quarter. The Tigers went on to win the game by nine points.